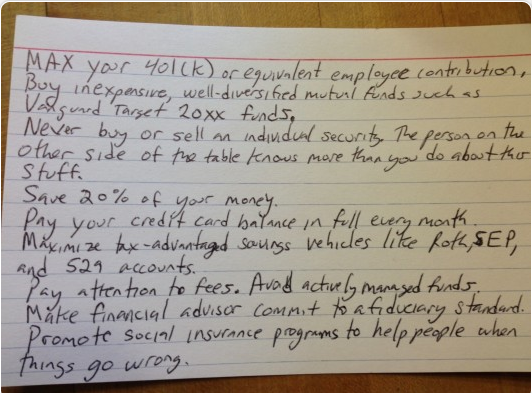 What *is* this simple free best personal finance advice that fits on a 3×5 card? Straightforward financial advice on one index card… Of course, having the plan, financial or otherwise, is one thing while implementing is a bigger issue. This index card aligns with promoting Index Card Cure™: Small changes, big difference. 1. It Makes Decisions Obvious. When you’re faced with a list on an index card, it becomes a lot more difficult to quibble with what you need to do… We’re more likely to follow through when we’re really clear about what we need to do to reach our goals. 3. It Goes With You Everywhere. By carrying an easy-to-reference reminder, it’s more likely that you can align your decisions and improve the odds you’ll reach your goals. Whether it’s a bucket list or a shopping list, an index card is a useful guide. September 25, 2014 in Need-to-know, organizing.